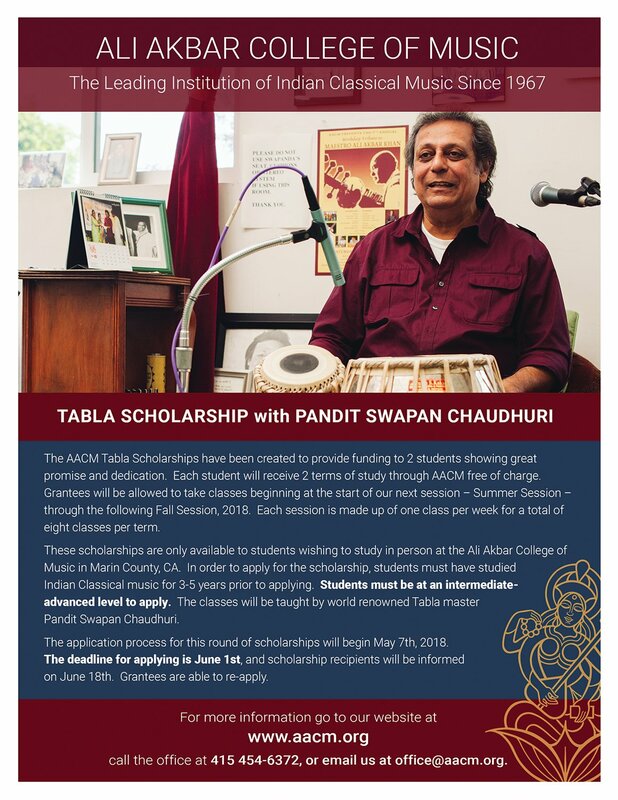 The AACM Tabla Scholarships have been created to provide funding to 2 students showing great promise and dedication. Each student will receive 2 terms of study through AACM free of charge. Grantees will be allowed to take classes beginning at the start of our next session – Summer Session – through the following Fall Session, 2018. Each session is made up of one class per week for a total of eight classes per term. These scholarships are only available to students wishing to study in person at the Ali Akbar College of Music in Marin County, CA. In order to apply for the scholarship, students must have studied Indian Classical music for 3-5 years prior to applying. Students must be at an intermediate-advanced level to apply. The classes will be taught by world renowned Tabla master Pandit Swapan Chaudhuri. The application process for this round of scholarships will begin May 7th, 2018. The deadline for applying is June 15th, and scholarship recipients will be informed on June 22nd. Grantees are able to re-apply. Students must email a detailed letter answering the following questions to office@aacm.org. 1. What is your name, age, email address and phone number? 2. What is your musical background and which instrument do you wish to study on? 3. Where are you located and do you wish to take classes in person or online? 4. Record a 5-10 minute video showcasing your abilities on the instrument of your choice for our panel to review. 5. Explain why you wish to apply for this grant and how you feel this training will help you in your musical life. 1. You must provide your own instrument to study on. 2. You must have a device on which to record your lessons. 3. Students will not distribute, share or sell any recordings/musical notation of lessons they have learned through their time studying at AACM. All recordings/musical notation are for the students learning purposes only. A contract will need to be signed by the recipients prior to the beginning of the scholarship. The AACM scholarship covers the full cost of ($800 USD) for 2 sessions worth of classes at AACM for a total of 16 classes per student. AACM will not provide housing, internet, computer or any additional materials that students may require while studying. Grantees are able to re-apply each year. For more information call the office at 415 454-6374, or email us at office@aacm.org. "This music is for everyone. Like fresh air, or clean water. In old times, when the old maestros sang or played instruments in the temple, all the animals, birds, tigers, lions, everything, anyone came to hear the music."